The highlight of today's ride (rather sad really!!) was the bodging that is now very noticeable on both our bikes and apparel! 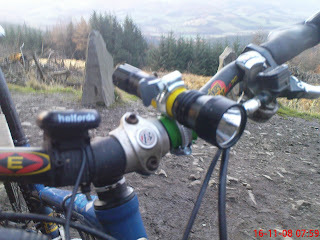 Having spent a fairish bit on various devices in an attempt to ensure his bike and new light remained joined together, and with very little success I might add, Baz concocted a device made up of 2 jubilee clips. the piece de resistance was the top clip which had a butterfly handle on it, to enable quick removal of said torch! He was not amused when I said it reminded me of a sardine tin. However it worked admirably. 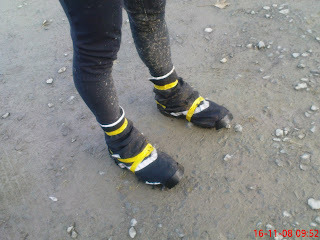 Clive's rough and ready handiwork consisted of ensuring that his cycling overshoes remained attached to his legs via several yards of bright yellow insulating tape. It would appear that the roughness that is apparent in most of my own bits and pieces has influenced the two of them in various ways! Everything worked though, so as I used to say about my own bodge jobs "CBE" ............... crude but effective! should i show the world your bodge on my wee bike?????? why not, and while you're at it how about some invesment advice?!? What a pair of "pins"........should be on "Strictly"
And, can you tell me the nearest stockist of the "Nora Battys"?